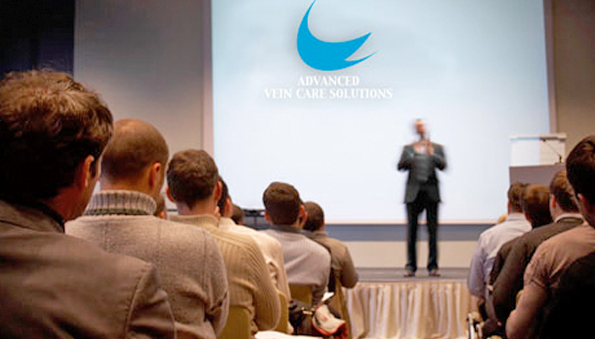 Advanced Vein Care Solution’s physician and team of specialists will happily provide a series of educational and informative tutorial sessions and seminars for those interested in learning more about the field of Phlebology (the study of veins). Join us for one of our seminars where we provide current information on the advancements and most recent techniques to treat vein disease. The materials presented in each seminar are based on the most recent research and publications prepared by one or more of AVCS’s accomplished team. We discuss the latest thinking on a variety of relevant topics by the leading experts in our field. Whether you are a patient interested in learning more about your condition, a vein specialist, or a health care professional wanting to know about the latest research, our caring and skilled staff will elevate your understanding of vein disease and its treatment modalities. Tour our facility and have the opportunity to personally speak with our dedicated team. Ask us today about our next scheduled engagement. We welcome your interest and look forward to meeting you!